Belle cabane sur 7 hectares sur la rivière Broad nichée dans un endroit privé de la forêt. La cabine est de 675 pieds carrés, frais de nettoyage de 45 dollars, 20 supplémentaires pour les animaux de compagnie indépendamment de la durée du séjour., Vue incroyable du site, Les activités comprennent la pêche, la recherche d’or, la randonnée, l’équitation. La rivière est à 1000 mètres au pied de la colline. Les routes de la guerre civile longe la rivière.. , accès facile à la propriété depuis la route principale, à proximité des aéroports de Greenville, Charlotte et Ashville, à 30 minutes de Rutherfordton. 16 km du centre équestre de Tryon. Roche de Chimney, lac Lure et grotte des chauves-souris à environ 30 minutes. Les chiens n'acceptaient pas les chats. ### attention l'accès à la cabine est d'environ 18 marches, la rivière est d'environ 1000 pieds en bas d'une colline escarpée. Je vais ici pour améliorer mon endurance et guérir des interventions chirurgicales, je suis un physiothérapeute de 67 ans. et cette propriété a des propriétés curatives inhabituelles, l'argile molle fait des merveilles pour mon mauvais genou, je ne sais pas pourquoi. Mon eau de source est incroyable, j'essaye toujours de partir avec le plus possible. This was such a wonderful spot! A perfect retreat. Sunrises were amazing and the short hike to the river was great exercise. Lounging on the porch and reading was blissful. I will definitely return. We had a wonderful time in this cozy cabin. The cabin was just enough space for our family. Despite the rainy weather the kids and our dog had a blast outside. Mark was awesome making sure we found the property, as we arrived after dark, he also was very knowledgeable in advising us about various things we can do with the kids in the area. The cabin had all the necessities that you would need in a temporary home away from home. I hope we can do a late spring/early summer trip as well, would love to see the property in all of its green glory! This is definitely a gem! Thank you! The cabin is a nice get away. We were able to relax, or go out and explore the outdoors, hiking, fishing, etc. Beautiful scenery. Relaxing get away with beautiful surroundings. 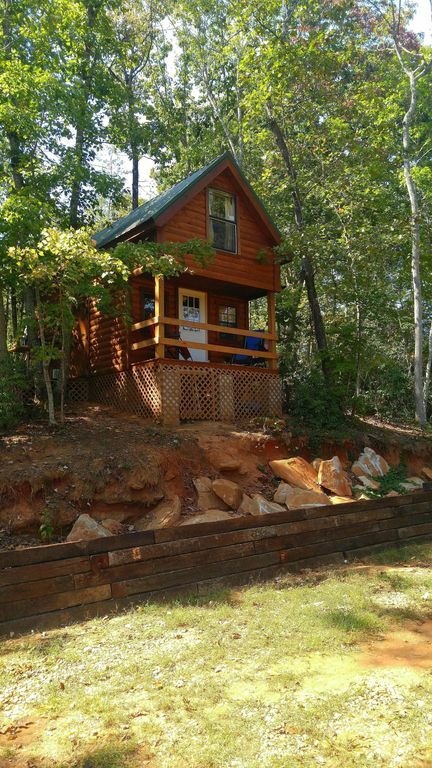 Wonderful little cabin!! Mark is Awesome! First off, Mark was a WONDER to work with! He called and checked up on my boyfriend and I to make sure we were making it there okay, he gave us everything we needed for a weekend trip away from everything! The property is stunning, and definitely a challenge to walk up the slope. Our dogs loved it as much as we did. We have two dogs that weigh about 50lbs each and we all fit comfortably in the cabin.. It's about 30 minutes from town, and I think it took us about 45 minutes to reach the Blue Ridge Parkway (would also highly recommend if you're a photographer or just love the view of the mountains). There's no wifi but we still had service on our phones, if that's super important to you! The beds were SUPER comfortable, plus the view out of the bedroom window was beautiful. We couldn't find a good spot to climb into the river with the dogs (but we also didn't look very hard, just strolling around), but the walk was still worth it! There were quite a few stink bugs (I think that's what they were) but if I was fine, I'm sure any normal being that's not as dramatic as I am will be fine! All in all, this was a GREAT trip and I hope to come back some day!